Despite no obvious geographical distinctions from the other U.S. states that would explain it, North Carolina is awash in solar energy facilities, more so than every other state except California. That is because the distinctions driving it are political, not geographical. A key reason is how North Carolina implements a four-decades-old law, the Public Utility Regulatory Policies Act of 1978 (PURPA). Among other things, PURPA mandates that utilities buy any power generated from qualifying renewable energy facilities in their area, at predetermined prices, regardless of market need. States set the terms as to which facilities can qualify, what those prices are, and how long they are in effect. As this paper will explain, North Carolina’s decisions on those factors differ significantly from other states to the special benefit of solar facilities — and ultimately to the detriment of electricity consumers. There have been some important changes since PURPA became law. The resource fears of the 1970s (for example, the “Peak Oil” theory) have been obliterated by technological innovation3 in acquiring energy resources (domestic resources at that).4 Also, power markets are much different now. PURPA’s mandatory purchase obligation for electric utilities to buy power from qualifying renewable power facilities at set “avoided cost” rates (the cost utilities supposedly “avoided” by buying power from renewable facilities rather than generating it themselves) led to building booms and competitive power markets in much of the country. Basically, PURPA’s must-buy provision no longer applies to much of New England, the Midwest, New York, Texas, and parts of California. It still applies to much of the Northwest and Southeast, including North Carolina. In fact, PURPA’s strictures affect North Carolina more than most other states. The way North Carolina has chosen to implement PURPA regulations is very favorable to solar energy facilities. In fact, North Carolina has several other public policies that are very favorable toward solar energy facilities. Their combined effect is that North Carolina alone is home to 60 percent of all PURPA projects in the entire United States.10 See chart. North Carolina relies on a combination of terms that are all very generous to solar energy facilities. For example, North Carolina has the highest avoided-cost rates and the longest fixed-rate contract terms of any state in the Southeast U.S. North Carolina also allows qualifying renewable power facilities up to 5 megawatts (MWs) in size (or 5,000 kilowatts, kWs). 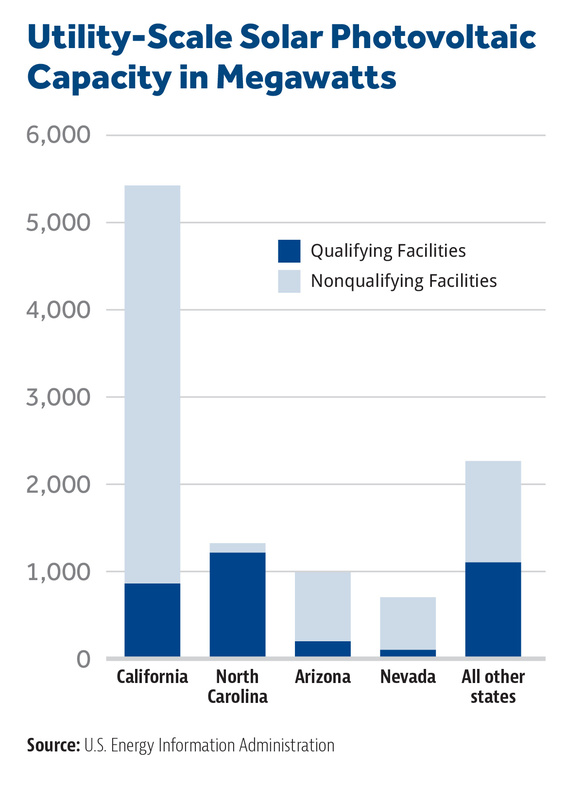 Many states are at the Federal Energy Regulatory Commission minimum of 100 kW, though some go to 20 MWs or more. Ten years later, those other states — Alabama, Arkansas, Georgia, Kentucky, Louisiana, Mississippi, South Carolina, and Tennessee — still haven’t imposed a renewable energy portfolio standard mandate on their retail electricity consumers. North Carolina has. The chart and map shown previously illustrate how North Carolina ranks with other Southeastern states in maximum contract terms, avoided-cost rates, whether they are fixed or variable, size limits of qualifying renewable power facilities, and whether they have also instituted a Renewable Energy and Energy Efficiency Portfolio Standard mandate. No other Southeastern state has combined terms like North Carolina’s so highly favorable to solar energy facilities. Energy policy is of significant public interest not because of a particular kind of power producer, however. It is of significant public interest because electricity is a necessity for everyone, every household, and every business. 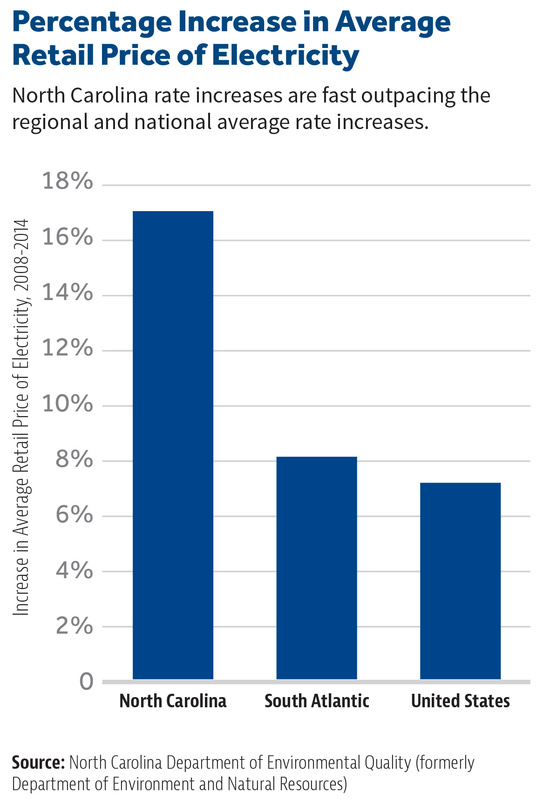 Things that affect electricity rates resonate throughout the economy. And that domino effect will only get worse as the Renewable Energy and Energy Efficiency Portfolio Standard mandate grows larger and more solar facilities get built and generate output North Carolina’s utilities have no option but to take. 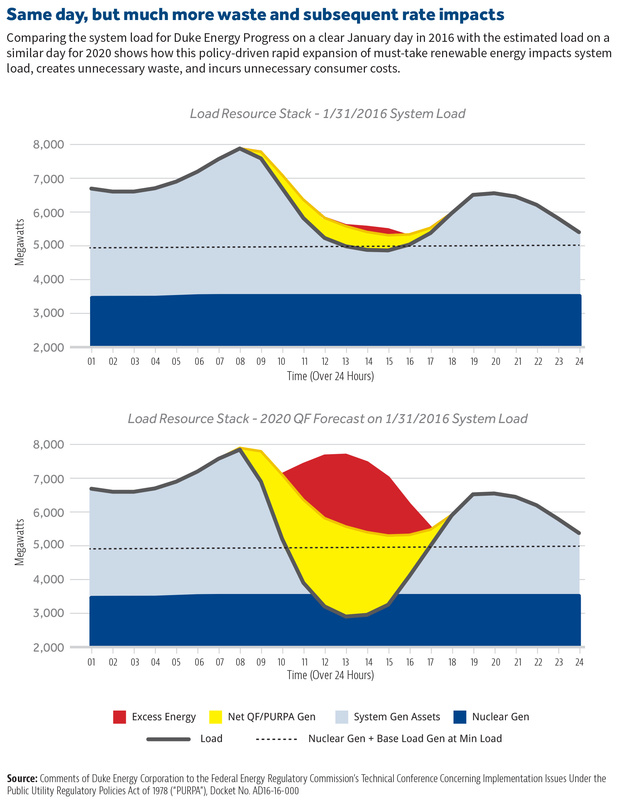 Compare the effect on Duke Energy Progress of must-take renewable energy on a clear January day in 2016 (mandate at 6 percent) with the estimated effect on a similar day for 2020 (mandate at 10 percent). See chart. PURPA and North Carolina’s overbroad interpretation of its mandates are heaping unnecessary costs on North Carolina ratepayers. This problem is made worse by other state policies favoring renewable energy facilities, especially the Renewable Energy and Energy Efficiency Portfolio Standard mandate. But as those costs are driven by policy, they can be addressed by policy changes. The Federal Energy Regulatory Commission gives states wide latitude to set contract term lengths, decide on how to calculate avoided-cost rates and let them be fixed or variable, and decide upon the size of qualifying facilities. Many other states have already lowered their avoided-cost rates and contract lengths. Where North Carolina’s policies differ significantly from other states’ — significantly longer contract terms, significantly higher avoided-cost rates, fixed rather than variable rates, etc. — North Carolina policymakers can and should rein in PURPA requirements. The state’s Renewable Energy and Energy Efficiency Portfolio Standard mandate is slated to increase from 6 percent this year to 10 percent next year and 12.5 percent in 2021. That’s more than double in four years, and more than a quadrupling since 2014. Policymakers should repeal the Renewable Energy and Energy Efficiency Portfolio Standard altogether. 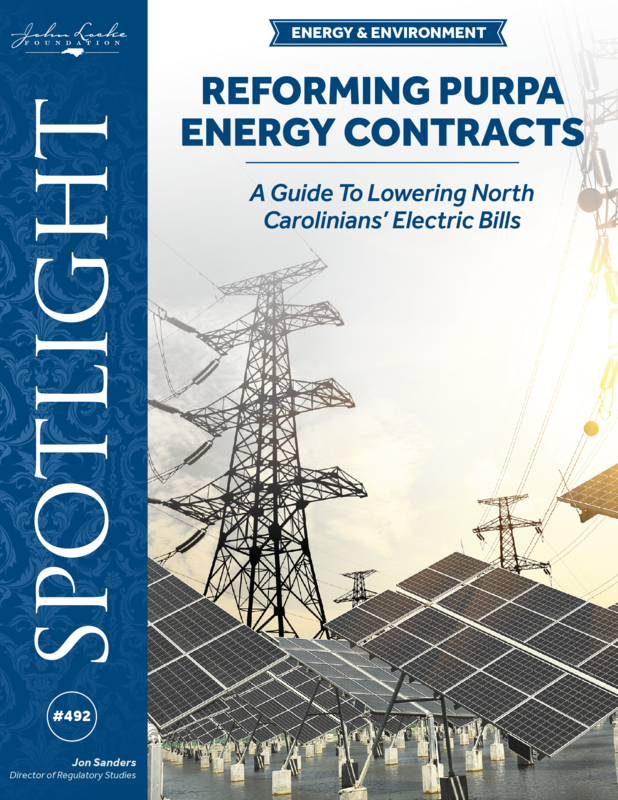 They should weigh its effects on rates and system reliability, its contribution to the energy load domino effect, and other issues affecting ratepayers before deciding what is the best approach for energy policy for North Carolinians going forward. Further, policymakers should stop excluding 80 percent of the appraised value of solar energy facilities from property taxes. They should also resist pressure to reinstate the 35 percent investment tax credit for renewable energy facilities. 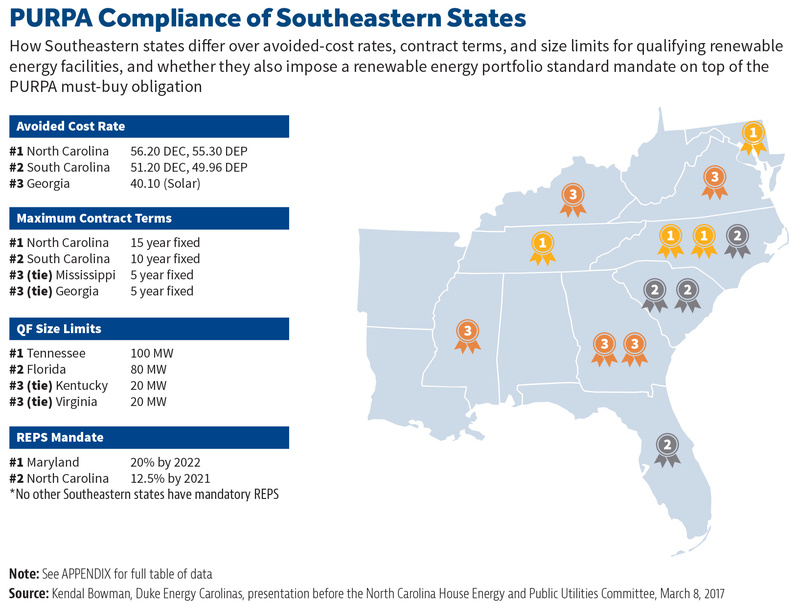 How Southeastern states differ over avoided-cost rates, contract terms, and size limits for qualifying renewable energy facilities, and whether they also impose a renewable energy portfolio standard mandate on top of the PURPA must-buy obligation. The Public Utility Regulatory Policies Act of 1978, a Carter-era law passed during the oil and energy crises of the 1970s. 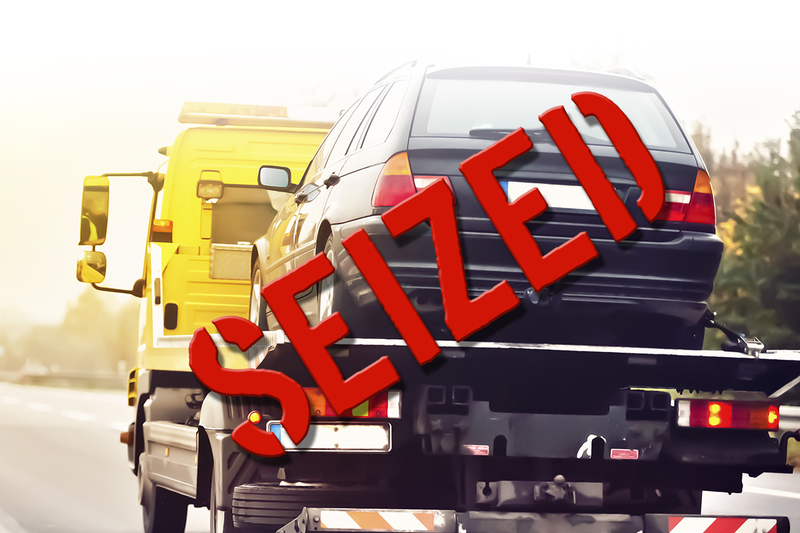 The regulatory agency that enforces PURPA. The discussion in this paper surrounds the use of qualifying small power production facilities. PURPA requires that electric utilities must buy any power generated from qualifying facilities in their territory, regardless of need, as long as the qualifying facility can deliver its power to the utility. 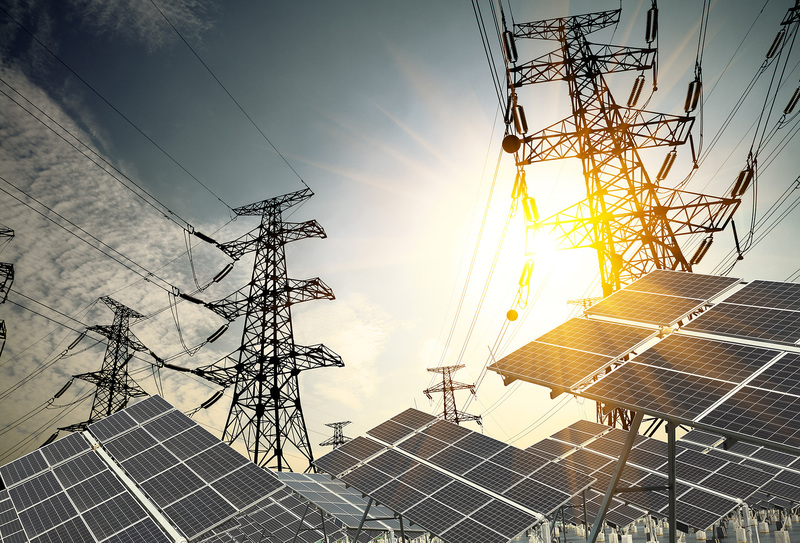 PURPA requires that electric utilities must interconnect qualifying facilities to their electric system — to sell them the energy to power their operations and for them to be able to deliver their energy that the utility must take. Setting avoided-cost rates is a controversial topic. 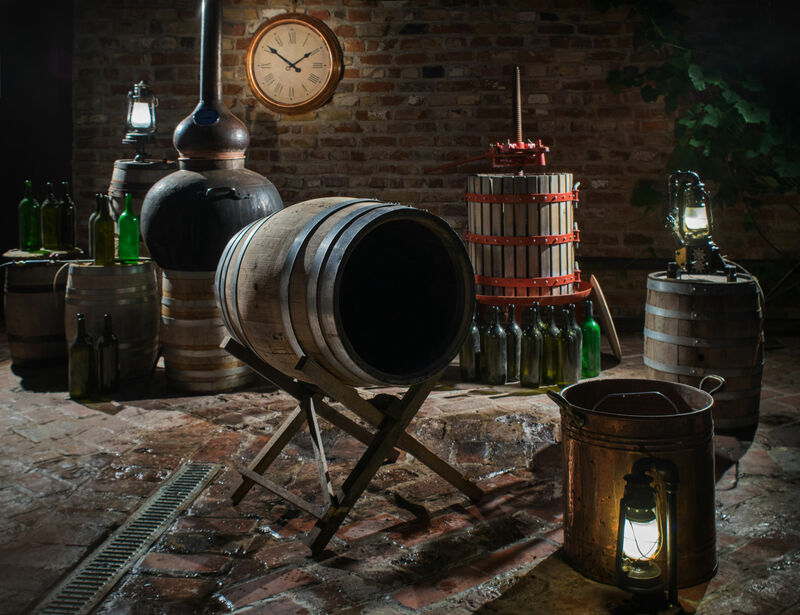 There are several methods to determine avoided cost. The Federal Energy Regulatory Commission lets states decide which one to use. The contract between an electric utility and a qualifying facility for the utility to buy the facility’s power at the avoided cost. A 2007 state law that requires utilities to generate a growing percentage of their retail sales from new renewable energy resources, in combination with energy efficiency programs. The schedule for electric membership corporations and municipal electric utilities is similar but tops out at the 10 percent requirement of 2018 and beyond. 1. Jimmy Carter, “Address to the Nation on Energy,” April 18, 1977, viewable at http://www.presidency.ucsb.edu/ws/index.php?pid=7369. 2. The original text of the Public Utility Regulatory Policies Act of 1978 is viewable at https://www.usbr.gov/power/legislation/purpa.pdf. For discussion, see Travis Fisher, “PURPA: Another Subsidy for Intermittent Energies,” MasterResource, January 22, 2013, https://www.masterresource.org/energy-efficiency/purpa-renewable-energy-subsidies, and “Public Utility Regulatory Policies Act,” Union of Concerned Scientists, http://www.ucsusa.org/clean_energy/smart-energy-solutions/strengthen-policy/public-utility-regulatory.html. 3. Jon Sanders, “So CO2 emissions are down nearly 15% in NC since 2000—mostly thanks to fracking,” The Locker Room, John Locke Foundation, January 17, 2017, http://lockerroom.johnlocke.org/2017/01/19/so-co2-emissions-are-down-nearly-15-in-nc-since-2000-mostly-thanks-to-fracking. 4. See, e.g., Rob Wile, “Peak Oil Is Dead,” Business Insider, March 29, 2013, http://www.businessinsider.com/death-of-peak-oil-2013-3, James Pethokoukis, “Creative destruction wins again: How innovation killed ‘peak oil,’” AEIdeas, American Enterprise Institute, July 16, 2013, http://www.aei.org/publication/creative-destruction-wins-again-how-innovation-killed-peak-oil, and Jon Sanders, “Peak Oil blog waves the white flag,” The Locker Room, John Locke Foundation, July 16, 2013, http://lockerroom.johnlocke.org/2013/07/16/peak-oil-blog-waves-the-white-flag. Cf. Julian Simon, “When Will We Run Out of Oil? Never!”, Chapter 11, The Ultimate Resource II, Princeton: Princeton University Press, 1981; 2nd edition 1996; viewable at http://www.juliansimon.com/writings/Ultimate_Resource/TCHAR11.txt. 7. See, e.g., John Downey, “N.C. ranks second nationwide for solar on the power grid,” Charlotte Business Journal, September 12, 2016, www.bizjournals.com/charlotte/news/2016/09/12/n-c-is-second-nationwide-for-solar-on-the-power.html. 8. For a contrast, see Jon Sanders, “The Market Forces Behind North Carolina’s Falling Emissions,” Spotlight No. 486, John Locke Foundation, January 31, 2017, https://www.johnlocke.org/research/the-market-forces-behind-north-carolinas-falling-emissionsnew-research-shows-that-improvements-are-market-oriented-not-government-driven. 9. A March 2017 fundraising call from the NC Sustainable Energy Association explained: “North Carolina is now second in the nation for installed solar capacity. … Much of the utility-scale solar industry’s success can be attributed to our state’s strong clean energy policies, such as favorable contracts and rates paid to these facilities for the energy and generation capacity they provide.” Clean Energy Storyteller, NC Sustainable Energy Association, March 2017, https://energync.org/wp-content/uploads/2017/04/March-Clean-Energy-Storyteller.pdf. Also see, e.g., Luis Martinez, “NC Now Second In Solar; Smart Policies Can Keep It That Way,” Natural Resources Defense Council, September 20, 2016, https://www.nrdc.org/experts/luis-martinez/nc-now-second-solar-smart-policies-can-keep-it-way, and Donna Robichaud, “Why is Utility Scale Solar So Popular in North Carolina?”, slide 6, “Why is utility scale solar booming in NC?”, QF Solutions LLC, presentation to Epic Energy Seminar, Energy Production & Infrastructure Center, The William States Lee College of Engineering, University of North Carolina at Charlotte, April 7, 2015, viewable at http://epic.uncc.edu/sites/epic.uncc.edu/files/media/Apr%207_Donna%20Robichaud%20presentation.pdf. And more broadly, see Peter Dizikes, “Will we ever stop using fossil fuels? Not without a carbon tax, suggests a study by an MIT economist,” MIT News Office, Massachusetts Institute of Technology, February 24, 2016, http://news.mit.edu/2016/carbon-tax-stop-using-fossil-fuels-0224, and Kathleen Hartnett White, “Renewables are incapable of replacing hydrocarbons at scale,” The Hill, March 30, 2016, http://thehill.com/blogs/pundits-blog/energy-environment/274645-renewables-are-incapable-of-replacing-hydrocarbons-at. 10. Manussawee Sukunta, “North Carolina has more PURPA-qualifying solar facilities than any other state,” Today in Energy, U.S. Energy Information Administration, August 23, 2016, https://www.eia.gov/todayinenergy/detail.php?id=27632. 12. See, e.g., comments by Kendal Bowman at the Federal Energy Regulatory Commission’s Technical Conference Concerning Implementation Issues Under the Public Utility Regulatory Policies Act of 1978, Docket No. AD16-16-000, June 29, 2016, transcript viewable at https://www.ferc.gov/CalendarFiles/20160826133239-Transcript%20-%20062916technical.pdf, p. 86, and discussion in Owen Smith and Christa Owens, “5 Reasons for North Carolina’s Rapid Emergence As a Solar Energy Leader,” CleanTechnica, April 29, 2015, https://cleantechnica.com/2015/04/29/5-reasons-for-north-carolinas-rapid-emergence-as-a-solar-energy-leader. 13. Daren Bakst and Geoffrey Lawrence, “Renewable Energy At All Costs: Legislation ignores the will of the public and would have unintended consequences,” Spotlight No. 395, John Locke Foundation, July 9, 2007, https://www.johnlocke.org/research/renewable-energy-at-all-costs-legislation-ignores-the-will-of-the-public-and-would-have-unintended-consequences, p. 7. 14. “PURPA and Qualifying Facilities in North Carolina,” Duke Energy Corporation. 15. G.S. § 105-275 (45), “Property classified and excluded from the tax base,” viewable at http://www.ncga.state.nc.us/EnactedLegislation/Statutes/HTML/BySection/Chapter_105/GS_105-275.html. 16. See discussion at Don Carrington, “Renewable Projects to Cost Taxpayers Nearly $1 Billion,” Carolina Journal, December 17, 2015, https://www.carolinajournal.com/news-article/renewable-projects-to-cost-taxpayers-nearly-1-billion/. 18. Matthew Letourneau, “Southeastern Utility Commissioners to Congress: RPS Means Higher Prices for Consumers,” press release, U.S. Senate Committee on Energy & Natural Resources, June 6, 2007, www.energy.senate.gov/public/index.cfm/republican-news?ID=183a660e-c6ea-49e5-b4ce-8a0fe060365e. 19. S.L. 2007-397, http://www.ncga.state.nc.us/gascripts/BillLookUp/BillLookUp.pl?Session=2007&BillID=s3&submitButton=Go. Note: for municipally owned and electric membership utilities the Renewable Energy and Energy Efficiency Portfolio Standard mandate limit is 10 percent. Also, energy efficiency programs may account for 25 percent of the Renewable Energy and Energy Efficiency Portfolio Standard mandate requirement at first, then 40 percent by 2021. 20. Charles Bayless, Implementation Issues Under the Public Utility Regulatory Policies Act of 1978, Docket No. AD16-16-000, presented to the U.S. Federal Energy Regulatory Commission, June 16, 2016, viewable at https://www.ferc.gov/CalendarFiles/20160616092252-Bayless,%20NRECA.pdf. 21. See Jon Sanders, “Renewable Energy: Lobby’s report is more fog than light,” Spotlight No. 469, John Locke Foundation, June 3, 2015, https://www.johnlocke.org/research/renewable-energy-lobbys-report-more-fog-than-light. 22. Chris Juchau and David Solan, “Employment Estimates in the Energy Sector: Concepts, Methods, and Results,” Energy Policy Institute, Center for Advanced Energy Studies, Boise State University, March 2013, http://epi.boisestate.edu, viewable at http://www.ourenergypolicy.org/wp-content/uploads/2015/06/employment-estimates-in-the-energy-sector-concepts-methods-and-results.pdf. 23. See, e.g., Eugene M. Trisko, “Energy Cost Impacts on NC Families, 2015,” American Coalition for Clean Coal Electricity, January 2016, http://www.americaspower.org/wp-content/uploads/2016/02/NC-Energy-Cost-Analysis-116R.pdf; Gene R. Nichol, “Re: Docket E-100, Sub 133; Order Requesting Comments,” The Center on Poverty, Work, and Opportunity, University of North Carolina School of Law, statement to the North Carolina Utilities Commission concerning allocation methods in rate hike proceedings, July 6, 2012, viewable at http://www.ncwarn.org/wp-content/uploads/2012/08/NCW-motion-letter-from-UNC-Center-on-Poverty-statement-William-Marcus.pdf; Michael Jensen and William Shughart, “How green energy hurts the poor,” The Detroit News, August 4, 2016, http://www.detroitnews.com/story/opinion/2016/08/04/green-energy-hurts-poor/88282074; and Jon Sanders, “Graphing energy’s budget bite on NC’s poor,” The Locker Room, John Locke Foundation, June 21, 2016, http://lockerroom.johnlocke.org/2016/06/21/graphing-energys-budget-bite-on-ncs-poor. 24. David Fountain, “Solar policies need to change to benefit customers,” Charlotte Business Journal, April 25, 2017, http://www.bizjournals.com/charlotte/news/2017/04/25/viewpoint-solar-policies-need-to-change-to-benefit.html. 25. G.S. § 62-156, http://www.ncga.state.nc.us/gascripts/statutes/statutelookup.pl?statute=62-156. 26. See arguments in Docket No. E-100 Sub 140, In the Matter of Biennial Determination of Avoided Cost Rates for Electric Utility Purchases from Qualifying Facilities – 2014, North Carolina Utilities Commission, hearing June 7, 8, and 10, 2014, viewable at http://starw1.ncuc.net/ncuc/ViewFile.aspx?Id=bfd0ce81-d613-4eca-8a6a-dcf0abe3e901. 27. See, e.g., Michael Puttre, “Utility Commission Order Bolsters N.C.’s Status As A Rising Solar Power,” Solar Industry, January 8, 2015, http://solarindustrymag.com/utility-commission-order-bolsters-ncs-status-as-a-rising-solar-power; John Downey, “Solar industry welcomes order that leaves N.C. solar regs intact,” Triad Business Journal, January 2, 2015, http://www.bizjournals.com/triad/news/2015/01/02/solar-industry-welcomes-order-that-leaves-n-c.html; and Herman K. Trabish, “North Carolina regulators reject proposals to change utility-scale solar regulations,” Utility Dive, January 2, 2015, http://www.utilitydive.com/news/north-carolina-regulators-reject-proposals-to-change-utility-scale-solar-re/348314. 28. Kendal Bowman, Comments of Duke Energy Corporation to the Federal Energy Regulatory Commission’s Technical Conference Concerning Implementation Issues Under the Public Utility Regulatory Policies Act of 1978 (“PURPA”), Docket No. AD16-16-000, presented to the U.S. Federal Energy Regulatory Commission, June 17, 2016, viewable at https://www.ferc.gov/CalendarFiles/20160617152411-Bowman,%20Duke%20Energy%20-%20Long%20paper.pdf. 29. See “The Energy Report: A Snapshot of North Carolina’s Energy Portfolio Seven Years After Session Law 2007- 397,” North Carolina Department of Environment and Natural Resources, March 2015, viewable at http://portal.ncdenr.org/c/document_library/get_file?uuid=369122bb-0ed1-4974-b62c-3efec5930ff9&groupId=14, p. 26, and Jon Sanders, “Why it’s not enough to say ‘but our electricity rates are some of the lowest around,’” The Locker Room, John Locke Foundation, November 3, 2016, http://lockerroom.johnlocke.org/2015/11/03/why-its-not-enough-to-say-but-our-electricity-rates-are-some-of-the-lowest-around, chart viewable at http://lockerroom.johnlocke.org/wp-content/uploads/2015/11/elec-rate-increases.jpg. 30. 16 U.S. Code § 796 — Definitions, viewable at https://www.law.cornell.edu/uscode/text/16/796. 31. G.S. § 62-2 (3a) includes the “least cost mix of generation and demand-reduction measures” as a standard, and (4) includes “To provide just and reasonable rates and charges for public utility services,” but without the public-interest addendum; viewable at http://www.ncga.state.nc.us/gascripts/statutes/statutelookup.pl?statute=62. 32. “PURPA and Qualifying Facilities in North Carolina,” Duke Energy Corporation, and discussion at Frank Graves, Philip Hanser, and Greg Basheda, “PURPA: Making the Sequel Better than the Original,” Edison Electric Institute, December 2006, http://www.eei.org/issuesandpolicy/stateregulation/Documents/purpa.pdf.